If you're thinking of making Crock-Pot BBQ Chicken, save the juice from the Crock-Pot to make these super-easy sandwiches (or throw in an extra breast or two to make BBQ chicken quesadillas). That covers three meals with one easy-to-prepare recipe. Using two forks or your hands, pull the chicken into bite size pieces. Combine the shredded chicken with the 1/2 cup of juice from the slow cooker. 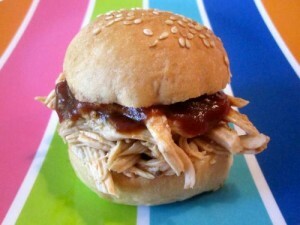 Place 1/4 of the mixture on a bun or roll, cover with additional barbecue sauce and serve.